Unique Stylish Purses | Miche Bags: Miche Purse Sale! Jayne Classic Shell with blocks of Sage, Canary, Tangerine & Eggplant Colors. Miche Purse Sale! 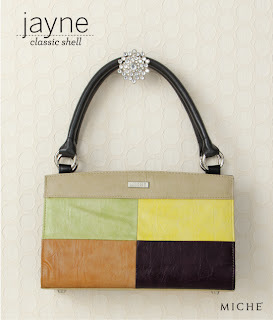 Jayne Classic Shell with blocks of Sage, Canary, Tangerine & Eggplant Colors. Blocks of sage, canary, soft tangerine and eggplant along with tan accents give Miche's Jayne for Classic Bags a joyful yet classic feel. It's a little bit retro and a little bit saucy! The lightly-crushed texture and sleek lines of this Shell allow its brilliant colors to grab the whole spotlight.